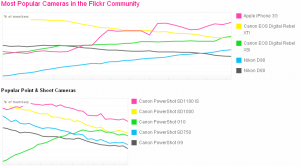 Flickr is one of the biggest photo sharing sites, and has a capability to recognize where the photos uploaded, are actually captured through. It recognizes the camera and saves the data. And according to that stats, Apple iPhone 3G camera has been the most popular camera for the year 2009, not just between the phones but also amongst all the digital cameras. The list shows iPhone 3G on the top, above some high-quality digital cameras from Canon and Nikon. These stats are only for those pictures which are uploaded on flickr, and as flickr and iPhone are good players for each other, the most number of pics uploaded on there are through the iPhone. It has a 3.2 megapixel camera but sometimes the shots taken are the best quality, depending on the surrounding conditions and photographic tactics. And the list above has no relation to the quality of the pictures, but gives importance to the number of pictures uploaded. Last year, iPhone was not the most popular camera but was the popular most cameraphone, and this year has climbed to the top of everything. The ranking would not be effected this year too for expecting 5-megapixel camera in the next iPhone. Like you said, next year its gonna be filled with iphone 5 mp. Canon n iphone occupy the top spots, yet none of them make the best cams. The list right now still shows the iPhone 3G on the top. Apple cameras are a killer. 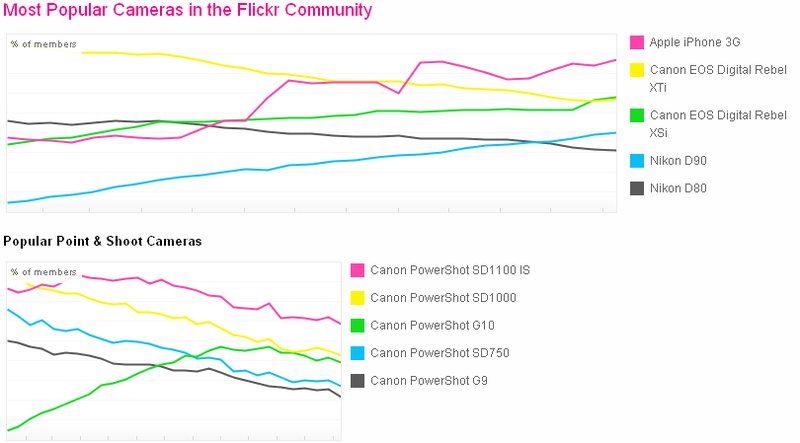 The 3G is on the top of the entire cameras list, beating the big SLR cameras too. And in the list of camera smartphones, the 3G, iphone 4 and the 3GS are on the top, above the HTC Evo 4G and the HTC Desire. What stuns me is that the camera of iPhone 3G is the most basic one amongst the iPhone family, still it’s the highest used and the most popular one.